My new gig: Robin's Roundup For the last few months I have been posting to our AudioFile blog every week. I love doing it! Each post of "Robin's Roundup" gives me the opportunity to talk about a wide variety of titles and also include tan- gential elements that add context. 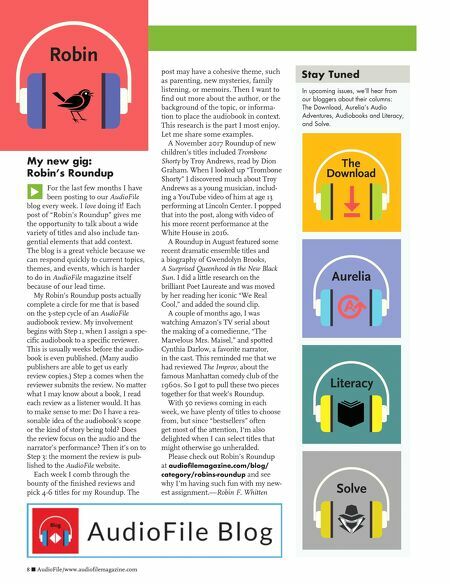 The blog is a great vehicle because we can respond quickly to current topics, themes, and events, which is harder to do in AudioFile magazine itself because of our lead time. My Robin's Roundup posts actually complete a circle for me that is based on the 3-step cycle of an AudioFile audiobook review. My involvement begins with Step 1, when I assign a spe- cific audiobook to a specific reviewer. This is usually weeks before the audio- book is even published. 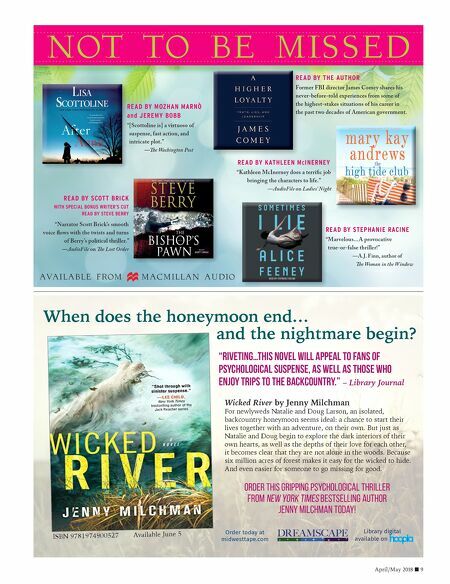 (Many audio publishers are able to get us early review copies.) Step 2 comes when the reviewer submits the review. No matter what I may know about a book, I read each review as a listener would. It has to make sense to me: Do I have a rea- sonable idea of the audiobook's scope or the kind of story being told? Does the review focus on the audio and the narrator's performance? Then it's on to Step 3: the moment the review is pub- lished to the AudioFile website. Each week I comb through the bounty of the finished reviews and pick 4-6 titles for my Roundup. The 8 n AudioFile/www.audiofilemagazine.com 8 n AudioFile/www.audiofilemagazine.com post may have a cohesive theme, such as parenting, new mysteries, family listening, or memoirs. Then I want to find out more about the author, or the background of the topic, or informa- tion to place the audiobook in context. This research is the part I most enjoy. Let me share some examples. A November 2017 Roundup of new children's titles included Trombone Shorty by Troy Andrews, read by Dion Graham. When I looked up "Trombone Shorty" I discovered much about Troy Andrews as a young musician, includ- ing a YouTube video of him at age 13 performing at Lincoln Center. I popped that into the post, along with video of his more recent performance at the White House in 2016. A Roundup in August featured some recent dramatic ensemble titles and a biography of Gwendolyn Brooks, A Surprised Queenhood in the New Black Sun. I did a little research on the brilliant Poet Laureate and was moved by her reading her iconic "We Real Cool," and added the sound clip. A couple of months ago, I was watching Amazon's TV serial about the making of a comedienne, "The Marvelous Mrs. Maisel," and spotted Cynthia Darlow, a favorite narrator, in the cast. This reminded me that we had reviewed The Improv, about the famous Manhattan comedy club of the 1960s. So I got to pull these two pieces together for that week's Roundup. With 50 reviews coming in each week, we have plenty of titles to choose from, but since "bestsellers" often get most of the attention, I'm also delighted when I can select titles that might otherwise go unheralded. Please check out Robin's Roundup at audiofilemagazine.com/blog/ category/robins-roundup and see why I'm having such fun with my new- est assignment.—Robin F. Whitten Stay Tuned In upcoming issues, we'll hear from our bloggers about their columns: The Download, Aurelia's Audio Adventures, Audiobooks and Literacy, and Solve.